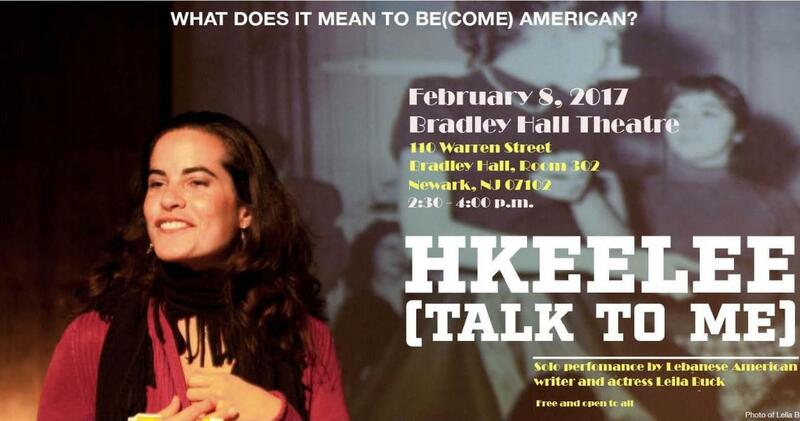 Lebanese-American playwright and performer Leila Buck will present her solo show HKEELEE (Talk to Me), a personal exploration of her family’s cultural heritage, at the invitation of the Rutgers-NJIT Theatre Program on February 8 at 2:30 p.m. in the Rutgers-Newark Bradley Hall Theatre, Room 302, 110 Warren Street. Admission is free. Buck’s solo show ISite, about growing up between the American and Arab world, toured the U.S., Europe and China for more than ten years, and is published in Four Arab-American Plays (McFarland Press 2013). Her second play, In the Crossing, an ensemble piece about her experience in Lebanon with her Jewish husband during the Israeli-Hezbollah war of 2006, and the challenges of telling that story on her return, has been performed at The Public Theater, the Culture Project, and New York Theatre Workshop. In 2014, Buck traveled to her mother’s home city, Beirut, for a residency with the Zoukak Theatre Company to lead workshops and develop HKEELEE (Talk to Me), an interactive exploration of her Lebanese grandmother’s loss of memory and her own journey to hold on to that heritage. Buck is currently developing a play with NJIT and Rutgers students titled Arabian Nights, American Dreams that will be presented April 26-29 at the Bradley Hall Theatre.